Mary Domenica was born on 9th May1837 at Mornese, Italy. Her family upbringing guided her in the way of solid piety, tireless hard work, and selfless service. At the age of fifteen she joined the association of the Daughters of Mary Immaculate, and began apostolic work among the girls of the neighbourhood. At the age of twenty-three, a serious attack of typhoid made a deep spiritual impression on her: the experience of her physical frailty deepened her abandonment to God and prompted her to open a dress-making workshop to teach local girls to work, pray and love God. Thanks to her intense sacramental life and the enlightened guidance of Don Domenico Pestarino, she made great progress in her spiritual life. Was she also a dreamer? While the Blessed Virgin obtained for Don Bosco every grace and favour he needed for the Construction of the Sanctuary at Valdocco, she was also preparing, the one who was to be placed by the saint at the head of the new Religious Institute he had in mind to found for quite some time. Mary grew up in the shadow of a little Church dedicated to Mary Help of Christians. On the day dedicated to our Lady of the snows, the first fifteen Daughters of Mary Help of Christians clothed themselves in the religious habit and pronounced the vows of Poverty, chastity and obedience in the presence of Don Bosco and of the Bishop of Acqui, Monsignor Maria Giuseppe Sciandra. Already a fervent child of Mary she became with some of her companions the first nucleus of the Institute of Daughters of Mary Help of Christian. Elected as Superior, she would only be called “Vicar” because Our Lady was the true Superior. It was before Mary’s image every evening that humbly and trustfully she would place the keys of the house. 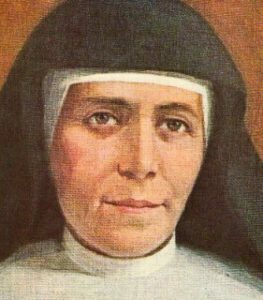 Don Domenico Pestarino, first director of the Daughters of Mary Help of Christians, declare: “Mary Mazzarello was always good and inclined to piety… She avoided convenience and softness… She was unpretentious and sincere in reproving wrong wherever she saw it. She spurned all human respect and worked only for the glory of God and the good of souls. She left to her Daughters an educational tradition permeated with evangelical guidelines: The search for God known through enlightened catechesis and burning charity, responsibility in work, sincerity and humility, austerity of life, and joyful self-giving. She died at Nizza Monferrato on 14 May 1881. She was beatified by Pius XI in 1938, and Pius XII Canonized her on 24 June 1951.